Cilantro, a citrusy-cool accompaniment to hot, spicy dishes and coconut milk sauces, plus it's good for you. Cilantro helps the body to detoxify. Place the cilantro, garlic, almonds, red pepper and Asiago in a food processor bowl; cover and pulse until finely chopped. Begin adding a drizzle of extra virgin olive oil and pulse to combine. Add enough olive oil to make a paste. Taste test for seasoning or texture adjustments. Serve a spoonful of cilantro pesto as a flavorful spike to soups and chili, stir-fries and hummus. Slather it on your favorite rice pasta. Use it as an appetizer spread with cream cheese and rice crackers. Schmear it on a brown rice pizza shell and top it with spicy vegetables and shredded jalapeno pepper cheese. Spoon it on a split baked potato and crumble goat cheese on top. Use a spoonful to make a salad dressing: just add olive oil, lemon juice, sea salt and fresh ground black pepper; whisk till combined. 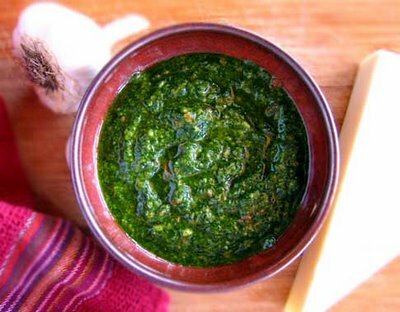 And don't forget quesadillas - this pesto would be fab on a grilled corn tortilla with sliced fresh tomatoes and shredded cheddar or goat cheese. Also called Cilantro Salsa. Great for side for adding a kick to any Hispanic dishes. For a thicker sauce, chop cilantro and garlic and place in a blender. Puree with 1/4 cup water and the oil. Add lime juice, cayenne pepper, coriander and salt. For a thinner sauce, chop cilantro and garlic very finely. Then stir in 1/4 cup water, oil, lime juice, cayenne pepper, coriander and salt.The emulsified version can be served as a dip with pita bread. Serve the thinner version with fried halloumi or other fried cheese, vegetable fritters or with a salad. First chop up the peppers, removing the seeds and the veins. Put them in a bowl of hot water to soak and put aside. Cut off the majority of the stems of the cilantro bunches and put the leaves (its ok to have some stems) into a food processor with the olive oil. Chop them up until they are finely chopped. Put this mixture into a bowl. Add 1 limes worth of juice. Drain the soaked peppers and stir them in. Take about 1 1/2 inches worth of goat cheese (off the cylinder that it usually comes as) and stir that in. Stir until the whole thing is throughly mixed (mash the cheese against the side of the bowl to get it to mix in). Now you can put it on most anything. I like it on gnocchi with some sautéed zucchini and onions mixed in. You could also probably sauté up some mushrooms to stick in there too. Its also really good on fish.